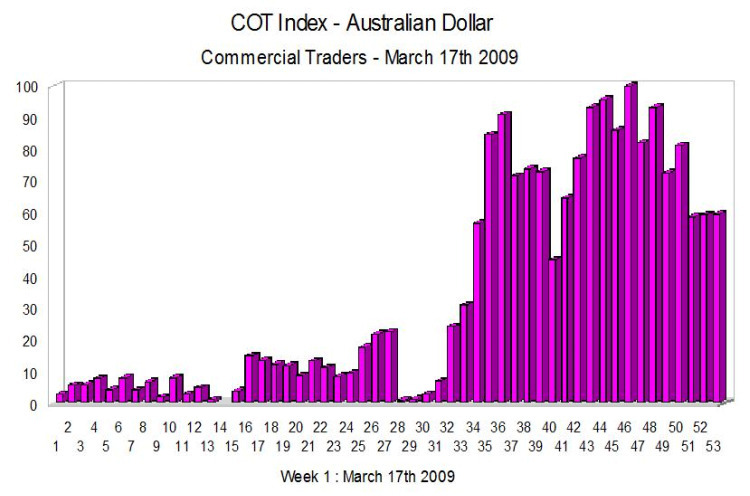 As we can see from this weeks COT report for the Australian Dollar (AUD ), the index for the commercial contract positions continues to remain at the extreme of the indicator, a position we have seen for the last few weeks, and one which aligns the situation in the spot market for the Aussie dollar, which has been moving sideways and consolidating since early November 2008. Whilst the COT index cannot give us precise timing signals for our trades, it can give us a direction for the future, and based on the above chart we should see the Australian Dollar begin to strengthen in the market in the short to medium term. In other words we should see the AUD/USD pair breakout and move higher, and indeed we should see this in other AUD denominated pairs.